Powermill 2019 is the first version of the established software package that included high rate deposition or directed energy deposition for high rate additive manufacturing. It has dedicated strategies producing toolpaths that drive robots having end-effectors such as wire, arc or laser-plus--blown-powder technology. Explains Clinton Perry, product marketing manager/industry strategy marketing – manufacturing: “It is not just a case of taking a subtractive toolpath and reversing it; it is way more complex than that. There are the ever-present risks of over- or underbuild, as well as overheating. If you cut the same toolpath twice, you’ve wasted nothing but time when subtractive cutting, but in additive you add more material and that can cause problems. So the simulation side for high rate deposition/directed energy deposition sees different ways of simulation. One level is virtual deposition, following the toolpath to show the shape of the built part, but that doesn’t simulate overbuild or thermal stresses that are caused, if you don’t manage power, speed or deposition rates. So Powermill 2019 has the capability to export data in a format that can be loaded into Autodesk’s NetFabb software and allow more in-depth analysis of the thermal properties of the build; are you putting stresses into the build that will result in a problem later on when you come to subsequent subtractive milling. That may not always be necessary, such as in blade tip repair, for example, but in the RAMLAB propeller (see box item, p15), you probably do.” Importantly, the goal is to simulate, learn, feed back into Powermill and simulate again to confirm that any problems have been eliminated. Vortex high efficiency roughing strategies have been a part of Powermill for some time, but this has been supplemented. The Vortex strategy maintains a constant engagement angle and so a constant force while milling with solid carbide cutters that employ deep axial depth of cut and small step-overs. Another Autodesk package has a similar feature, the Fusion cloud CAM solution HSM with its adaptive clearing. The strengths of the latter have been taken into the former, with addition of making toolpaths editable – a capability that Powermill users are used to having. This has added a new version of ‘Vortex from stock’, with ‘Vortex from model’ remaining available. This new option creates toolpaths with offsets that are based on both the shape of the part being produced and the stock being milled. The result is toolpaths that are considerably more efficient, offering shorter machining cycle times and fewer tool retractions. In recent tests carried out in Autodesk’s Advanced Manufacturing Facility (AMF) in Birmingham, a test mould was machined in P20 tool steel. The previous ‘From Model’ option took 48 m 28 s to complete. The ‘From Stock’ option used the same tooling, feeds and speeds and yet produced this same part in 32 m 33 s, a saving of 33%. In the forthcoming update to Powermill 2019, the application of Vortex is broadened to include inserted carbide tip tooling, reveals Perry. Moving to 5-axis machining and collision/near-miss avoidance has been made easier to achieve with Auto Tool Tilt. Powermill already has many options for users in this area, perhaps up to 10. “These are phenomenally powerful, but as an end user you had to choose the right one or go through a number of iterations to discover the best one for any circumstance. This made 5-axis programming more challenging than it needed to be. So, Auto Tool Tilt can be used regardless of the shape you are cutting and regardless of the type of toolpath being employed. We will identify a collision is occurring and tilt the tool away from it, doing so in a manner that minimises the movement of the five axes of the machine tool – avoiding collisions is great, but not if the machine is dancing around, which can create dwell marks that may require post-machining process.” And Auto Tool Tilt also averages multiple collision instances to select an orientation that will work for many not just a single collision, thus also minimising movement, while it will stay in that position until it needs to move again. The Powermill 2019.1 release will see this subtly improved through the addition of more aggressive filtering for rotary axes, such that they lock. And if a programme can effectively employ locked rotary axes, then since it will be 3+2 machining, it makes the program suitable for a wider range of machines, Perry offers. But, regardless, the outcome is even smoother, predictable toolpaths, he says. “You could have achieved the same result with Powermill before, but what this brings is ‘a one-stop’ shop option, no matter what you’re cutting or how you’re cutting,” he assures, and when asked why users wouldn’t tick the Auto Tool Tilt option box, he can’t think of a reason why, except where complete control over known positioning is personally preferred. But he says that in adding such functionality, the temptation to take what exists away is resisted because someone somewhere will want it. Feedback from those tempted to move away from Powermill on grounds of less-than-easy collision avoidance are reportedly very happy with this “magic button” solution, reports Perry. A new feature introduced in Powermill 2019 is ‘Set-ups’. “Fundamentally, a Set-up allows you to assemble a milling strategy, clamps and fixtures into one of these. Powermill is really good at creating good quality toolpaths, outputting them and cutting amazing parts. But if you have lots of toolpaths, it’s not always easy to make sure you’re outputting the right toolpath to fully machine the component. So, the idea is that a Set-up represents what you actually want to cut. You can order Set-ups and then run them and know you have the complete manufacturing process.” There are additional tweaks promised for Powermill 2019.1, too – “We are serious about continuing to develop Set-ups – 2019.0 takes in basic functionality, but we have a long-term plan to make Set-ups better,” Perry mysteriously offers, hinting at something significant. Also aiding the completion of a fully machined part is new rainbow shading within ViewMill that shows where stock remains or where gouges appear – finished, unfinished and gouged surfaces can be selected independently, too. And stock model improvements now help identify where remaining material exists by putting a boundary around it, so guiding where further machining should take place – principally for rest roughing. Powermill’s integration with the cloud, specifically Autodesk Drive, is also being developed. All subscribers (but not perpetual licence holders) have access to this (25 GB as standard). Autodesk Drive is a cloud storage solution that allows individuals and small teams to organise, preview and share any type of design or model data. This allows 3D views within a browser, meaning non-subscribers can take part in reviewing and marking up. So, Powermill 2018.4 included Autodesk shared views that offers sharing of part of a project but not the whole, including with non-subscribers, allowing mark up. Data is not being shared on the cloud, rather a safe, secure tessellated view is, Perry emphasises. Now, Powermill 2019.1 will introduce post-processors over the cloud. This sees post-processors hosted on the cloud, providing a secure method to make sure the correct version is used. More, Autodesk (https://is.gd/litoha) will ‘componentise’ post-processors, allowing them to be delivered more reliably and faster. Companies often require post-processors to be tailored, so Autodesk will work with companies to achieve that. And when a post-processor is completed, it gets added to a company’s cloud account. Multiple revisions can exist, with administrators granting access to authorised people. “By saving post-processors in the cloud, it gives us access and improves our ability to validate that an update is right and safe for a machine,” Perry underlines, adding again that cloud and is a direction of further development for Powermill. 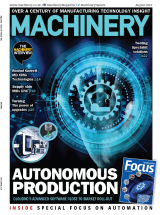 Other 2019.1 developments will include: more interactive collision avoidance for 3-axis machine tools; Pattern Turning; and On Machine Verification. In the first, while Powermill has allowed removal of the affected section automatically, meaning incomplete machined parts, the option to identify them, leave them in and manually take action is now allowed. Toolpath selection and editing are supported visually, with a number of existing editing tools employed to fix the collision. Successful edited toolpaths are visually identified afterwards with any remaining unmachined areas staying highlighted. Pattern Turning will replicate Pattern Milling, where a piece of geometry is sketched and then turned into a toolpath and vice versa. It is intended for high end users and allows for the creation of toolpaths not grounded in part geometry. Finally, the ability to create probing cycles without the need for Autodesk PowerInspect is added. So, probes are a new tool type and free-form surface inspection is a new strategy type in this release; more will follow. Points are selected on the model, with probing code generated. Milling post-processor updates are required to exploit this, of course. There are differences concerning results’ viewing between subscription and licence holders, it is highlighted. And, as with all Autodesk packages, not all the foregoing are available at all three levels of product – Standard, Premium and Ultimate are the levels offered. Birmingham-based Autodesk, like its predecessor operation Delcam, is keenly involved in many European projects. One of those is Rotterdam-based RAMLAB, a collaboration between three founding partners: Port of Rotterdam, InnovationQuarter and RDM Makerspace. The operation’s vision is “manufacturing certified metal parts on demand through additive manufacturing”. To be precise, it is the AM process of wire-arc additive manufacturing (WAAM) that it is pursuing, as this is considered most suitable for the large parts it is focused on – RAMLAB is located physically within the port of Rotterdam, with maritime and offshore parts the main interest. 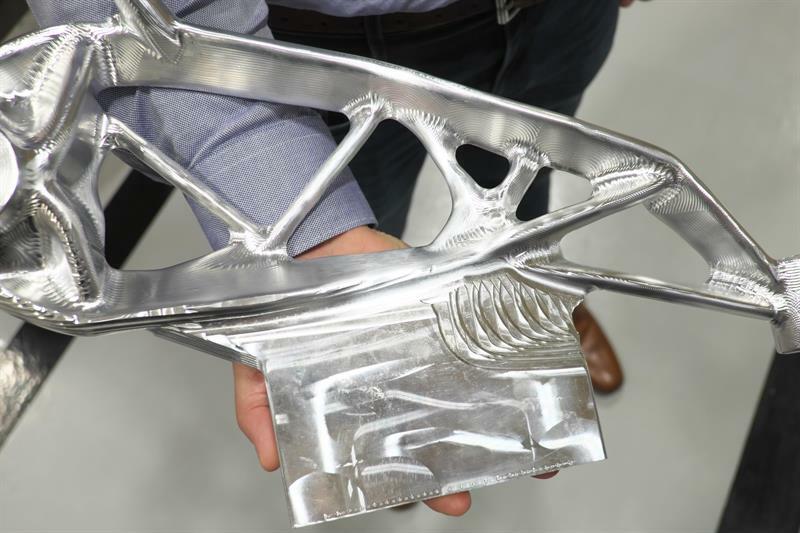 Autodesk Powermill software is supporting the organisation’s endeavours and Autodesk has a WAAM facility at its Birmingham base, too. The first use-case of its technology was for a replacement ship’s propeller, which gained much coverage during 2016/2017, with the most recent announcement on that being that it had been approved for use, following trials on a Damen Stan Tug 1606. The latest project is for a steel crane hook, based on a Huisman four-prong design. It will employ 3D printing benefits, such that the product will be hollow, significantly saving on material usage and production lead time. The hook will measure over 1 by 1 m in outer dimensions and weigh close to 1,000 kg, making it the world’s largest 3D-printed steel product, in terms of weight. Safe Working Load (SWL) will be 325 t and at the beginning of this year, Huisman successfully load tested a 3D-printed offshore crane hook with an SWL of 80 t.
Of particular importance is that three leading classification societies, DNV GL, Bureau Veritas and ABS, have joined this project. So the 3D-printed offshore crane hook will not only receive triple certification, but a significant step will be made in adopting rules for 3D-printed products for the maritime and offshore industry. Voestalpine Böhler Welding has joined the consortium to provide feed stock and materials expertise. Autodesk is again supporting the project. Another project supported by Autodesk is the now-concluded Symplexity (Symbiotic Human-Robot Solutions for Complex Surface Finishing Operations) initiative, which was a 15-member, 48-month EU project that looked at human-robot collaboration in the polishing process. Again, the Autodesk Birmingham site has a development facility. At Munich’s Automatica earlier this year, a cell for abrasive and fluid-jet polishing that enables safe parallel work of an operator and the robot demonstrated how polishing of complex surfaces can be greatly automated. With measurement performed using a CWS device (Coherent Wave Scatter System developed by project partner QISAB), closed-loop processing of the surfaces, further increasing the speed and repeatability of the process. Data analysis is supported by an augmented reality system, which Autodesk was involved with developing, that makes it possible to visualise measurement results directly on the physical parts.